Misako Akama started playing violin at the age of 3. She studied at TOHO high school of music, and at TOHO University with Shizuko Ishii, Seiji Kageyama, and Gérard Poulet until 2013. At the age of 15, she obtained the 3rd prize at the Tokyo Music Competition. In 2013, she entered Conservatoire National Supérieur de Musique de Paris. She received a Bachelor's degree, and a Master's degree with honours and praises by the jury. Currently, she is in the Artist Diploma (Diplôme d’Artist Interprète) programme, studying under Roland Daugareil, Christophe Poiget, Suzanne Gessner and Boris Garlitsky. 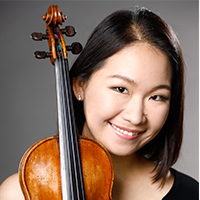 She has performed in masterclasses conducted by renowned violinists such as Pierre Amoyal, Ana Chumachenko, Yuzuko Horigome, Régis Pasquier, Pavel Vernikov, and others. In 2015/16, she participated in the masterclass of Salvatore Accardo at Academy Walter Stauffer in Cremona. In international competitions, she has won 2nd prize and Special Award of W.A. Mozart at the Henri Marteau International Competition, the Special Prize of P.Boulez at the Long-Thibaud Crespin Competition, and 1st prize at the Varna International Competition. As a soloist, she has appeared with orchestras such as the New Japan Philharmonic Orchestra, Hofer Symphoniker, and has in the past worked with conductors such as Fumiaki Miyamoto, Christophe Poppen, and Jamie Philips. Akama performs on a Nicolaus Gagliano (1735) violin that is loaned by the Zilber Foundation (France).